Down syndrome (DS), also called Trisomy 21, is a condition in which extra genetic material causes delays in the way a child develops, both mentally and physically. It affects about 1 in every 800 babies. Approximately 1:800-1,000 babies are born with Down syndrome. 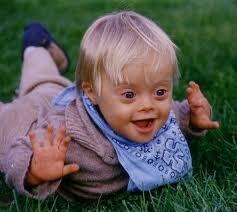 The physical features and medical problems associated with Down syndrome can vary widely from child to child. While some kids with DS need a lot of medical attention, others lead healthy lives. Though Down syndrome can't be prevented, it can be detected before a child is born. The health problems that can go along with DS can be treated, and there are many resources within communities to help kids and their families who are living with the condition. Although no one knows for sure why this common birth defect occurs and there's no way to prevent the chromosomal error that causes it, scientists do know that women age 35 and older have a significantly higher risk of having a child with the condition. At age 30, for example, a woman has about a 1 in 900 chance of conceiving a child with DS. Those odds increase to about 1 in 350 by age 35. By 40 the risk rises to about 1 in 100. Most people have 23 pairs of chromosomes, for a total of 46. But a baby with Down syndrome has an extra chromosome (47 instead of 46) or one chromosome has an extra part. This extra genetic material causes problems with the way their bodies develop. Some signs of a child with down syndrome is Face that is flatter than normal, Eyes that slant upward, Ears that are abnormally shaped, Neck that is shorter than normal, Eyes with Brush field spots (white spots on the iris). While Down syndrome is common, the symptoms an individual with Down syndrome experiences can vary. Some people may have several symptoms; others only a few. Some people experience severe symptoms of Down syndrome; others can have mild ones. I personally have a little cousin that was born with Down syndrome about two years ago. The reason why many kids are born with Down syndrome each year is because they have a different number of chromosomes within each cell and are made up of genes. Even though my cousin has Down syndrome, it doesn’t mean his family is going to love him any less. Though finding out your kid is going to be born with a defect is never easy to hear. You will still love your child no matter what.